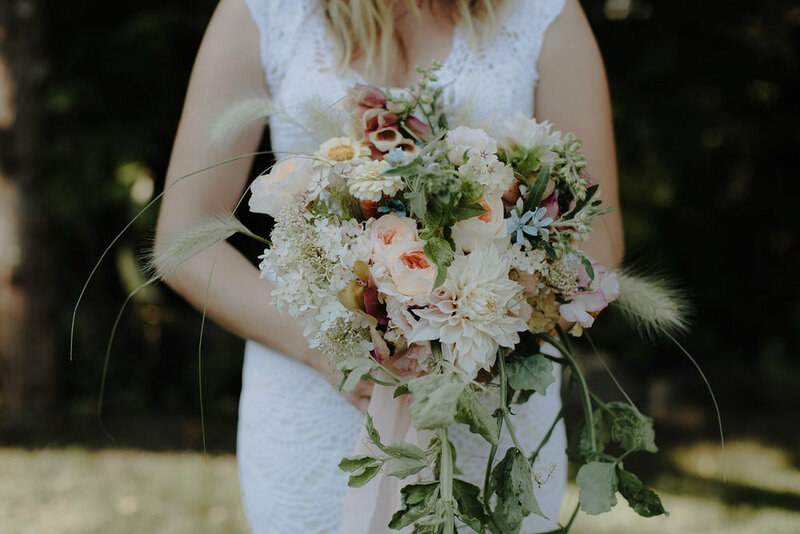 We offer bespoke floral designs for weddings, celebrations, and businesses in Vermont and beyond. From May to October, we use sustainably grown and foraged, fragrant blooms and foliage from our gardens in Craftsbury Common, Vermont. In all seasons, we work throughout Vermont and New England to bring you beautiful flowers. From the seed of an idea to the spread of blooms on your celebration tables, we will work with you every step of the way to realize your vision of beautiful, sustainable flowers for your wedding day. Have a look through our photos and get in touch to start your floral adventure! We grow a lush array of flowers, vines, and fragrant foliage in several gardens on our northern Vermont homestead, which has been free of pesticides from the very beginning. Each variety is carefully selected for its beauty, subtlety, and hardiness. Blossoming Bough Flowers offers seasonal, long-lasting floral arrangements for Vermont restaurants, inns, and offices. From a weekly refresh of flowers for all your restaurant tables to an occasional delivery for your desk, we are happy to oblige. Curious about what inspires us and how we do what we do?